Begins jazz instrument and harmony studies at the “Il Paese degli Specchi” school in San Lazzaro di Savena (Bologna, Italy). 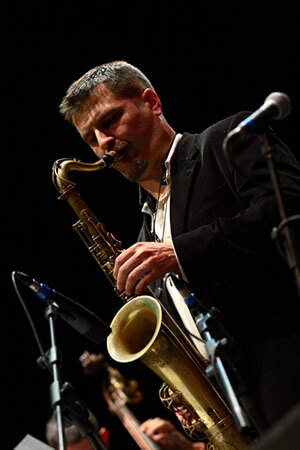 Attends the Siena Jazz Festival International Jazz Workshops three years running, and comes into contact with all the best-known Italian jazz musicians. Passes the Academic Diploma 1st grade in “Jazz and contemporary music” with full marks at the “G.B.Martini” State Conservatory in Bologna. Passes the Academic Diploma 2nd grade in “Jazz Saxophone” with a mark of 106/110 at the “A. Buzzolla” State Conservatory in Adria (RO). Winner of the 3rd “Isole Borromee (Verbania)” International Music Competition. “Massimo Urbani” National Award (Macerata) finalist and finalist in the Iceberg National Competition sponsored by the Municipality of Bologna. Studies with the Detroit alto saxophonist Mr. Larry Smith and attends workshops in Italy with the pianist Mr. Barry Harris. Studies in New York with saxophonist Mr. Charles Davis and attends more workshops with Mr. Barry Harris. Studies and became a close friend of the Washington D.C. tenor saxophonist Mr. Harry Allen. Teaches jazz instrument and harmony studies for four years at the “Accademia Culturale” in Bologna and wins a national competition for the chair of “Musica d’Insieme per formazioni Jazz” at the “A. Buzzolla” State Conservatory in Adria (RO). Holds regular jazz instrument and harmony workshops at Dusseldorf in Germany. Plays at major jazz festivals such as the Ancona Jazz Festival, the Veneto Jazz Festival, the Marche Jazz Network Festival , the Celerina Jazz Festival (CH), the Ascona Jazz Festival (CH), the Corinaldo Jazz Festival, the International Saxophone Festival, the Positano Art Festival and others. Has worked together with numerous, leading Italian and foreign musicians, including: Scott Hamilton, Danny Grissett, Paolo Alderighi, Paolo Birro, Antonio Ciacca, Gianluca Tagliazucchi, David Roberts, Gianluca Mannutza, Jimmy Villotti, Marco Bovi, Giancarlo Bianchetti, Davide Brillante, Bobby Watson, Carlo Atti, Pietro Tonolo, Piero Odorici, Henghel Gualdi, Wessel Anderson, Dusko Goikovich, Steve “Stiepko” Gut, Tom Kirkpatrick, Luciano Milanese, Paulo Cardoso, Gary Todd, Kengo Nakamura, Stefano Senni, Pietro Ciancaglini, Yves Rossignol, Paolino Dalla Porta, Ares Tavolazzi, Paolo Benedettini, Cheryl Porter, Melissa Stott, Eloisa Atti, Silvia Donati, Quincy Davis, Massimo Manzi, Gianni Cazzola, Massimo Chiarella, Alessandro Minetto, Vittorio Sicbaldi, Massimo Caracca.